Can you believe that it is already the middle of July? That means that Halloween is already just three short months away! Halloween parties are wonderful, but what’s even better? Decorating your home with items that you can enjoy all month long (or longer). If you’ve been following us for the past few months, you’ve seen ways to decorate for many types of parties. 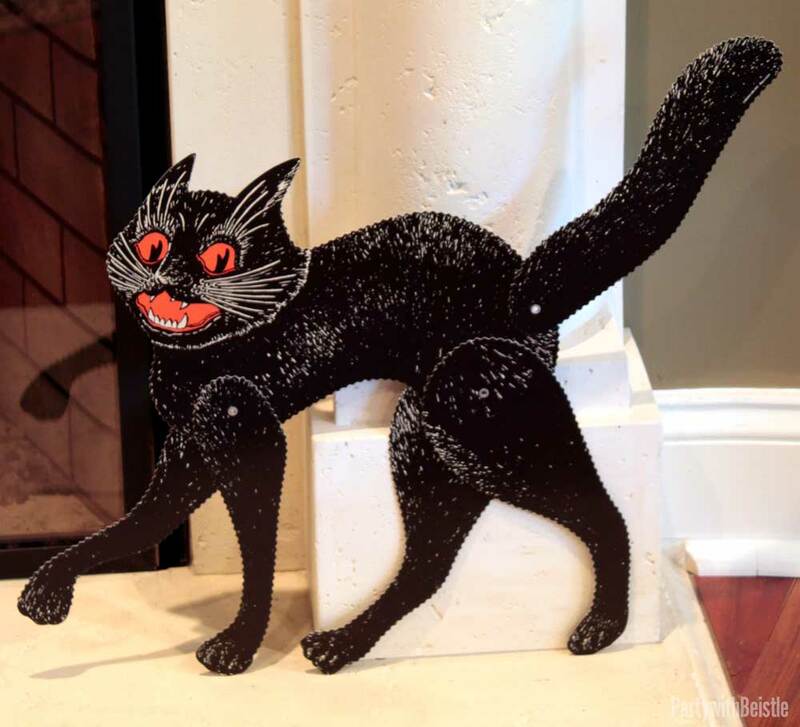 However, today we’re taking a different approach and I am going to show you how our Vintage Halloween decorations can be used as home décor that you can let up throughout the entire Halloween season. You may recognize or even feel a bit nostalgic when you take a closer look at some of these items. Recognize anything? Some of these items date the whole way back to 1930! We’ve always had a selection of Vintage Halloween items in our catalog, however, just a few weeks ago we re-introduced some additional items. 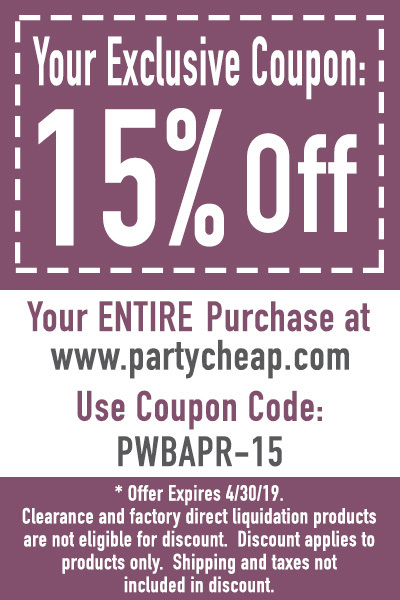 Be sure to check out our entire Vintage collection at Partycheap! If you have a fireplace mantle in your home, then you already know that you have the perfect place to decorate for all seasons & holidays. If you don’t have a fireplace…no problem! Windowsills, built-in furniture, buffets and tables are all great options to decorate as well. (Caution: Be sure not to set/hang anything too close if your fireplace has an open flame…ours has a glass covering on the outside). 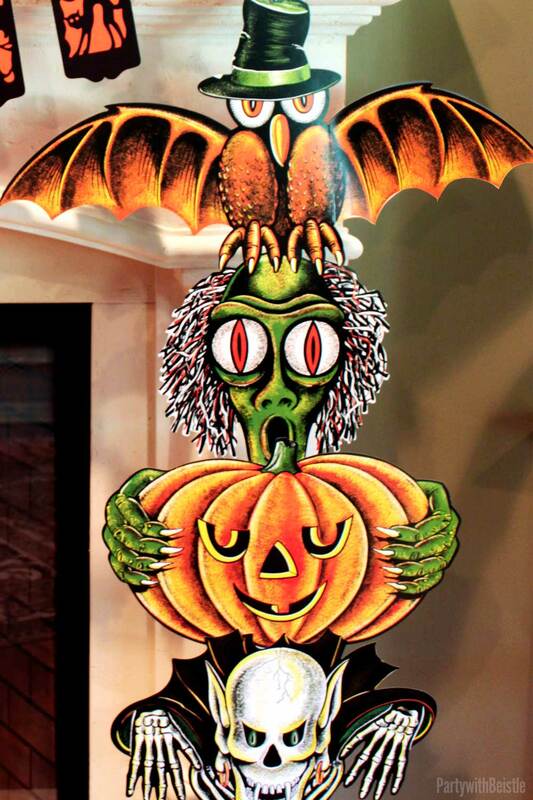 How cool are the Vintage Halloween Totem Pole Cutouts? They’re great because they can be used separately or combined (like I did) to create one item! I think it looks super cool hanging down the side of the mantle. 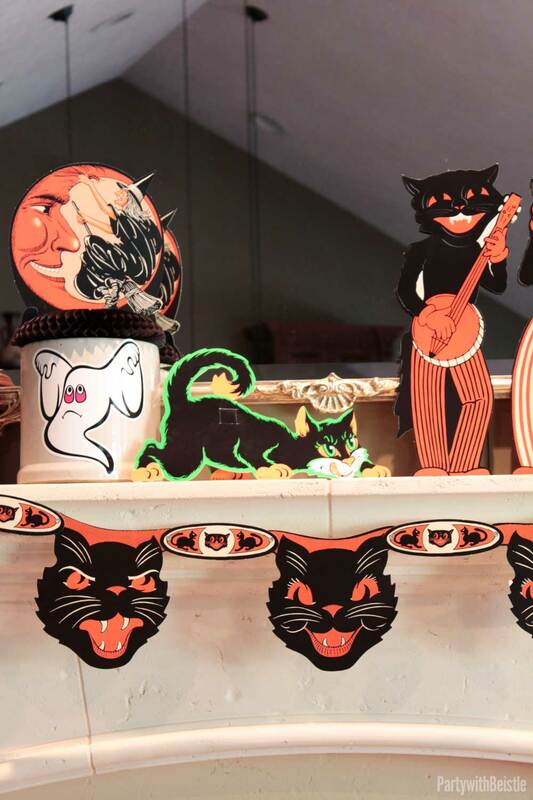 Recognize the Cat Cutouts from the early 70’s? Did you know they stand up? Honestly, I didn’t…until I took them out of the packaging and put them together. In the above image, the cat’s back leg is a separate piece. So when you attach it to the cat’s body using a tab & slot, it allows for him to stand freely! When decorating your home with the Vintage items, use vintage looking accents as well! 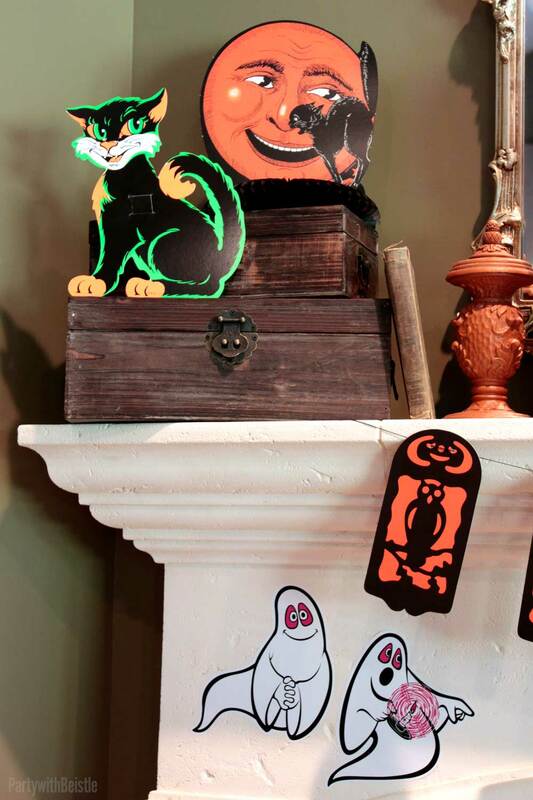 These wooden boxes paired great with the whole theme…and you can’t go wrong with using a few old books as filler. Talk about a classic! The Jointed Scratch Cat has been around for a long time. He is a definite must-have for your Halloween decorating this season. 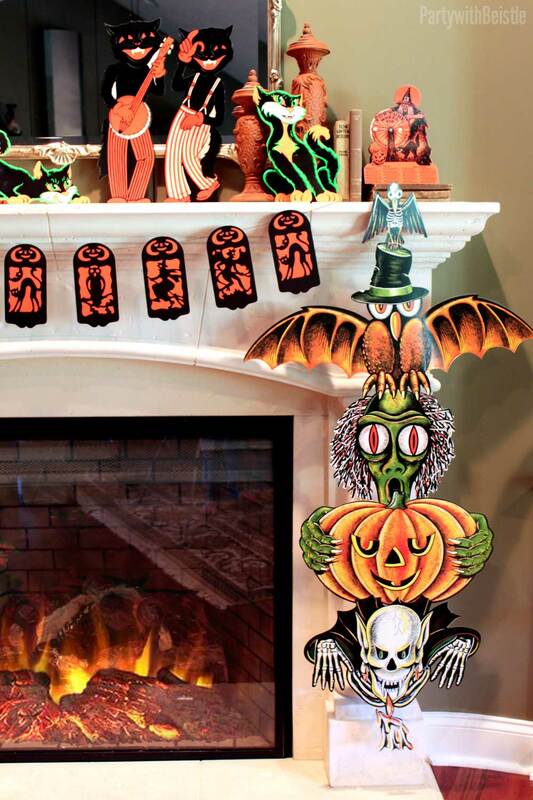 For some ideas on how you can use these decorations to decorate for a Halloween party, visit my friend, Miranda, at SpookyLittleHalloween. 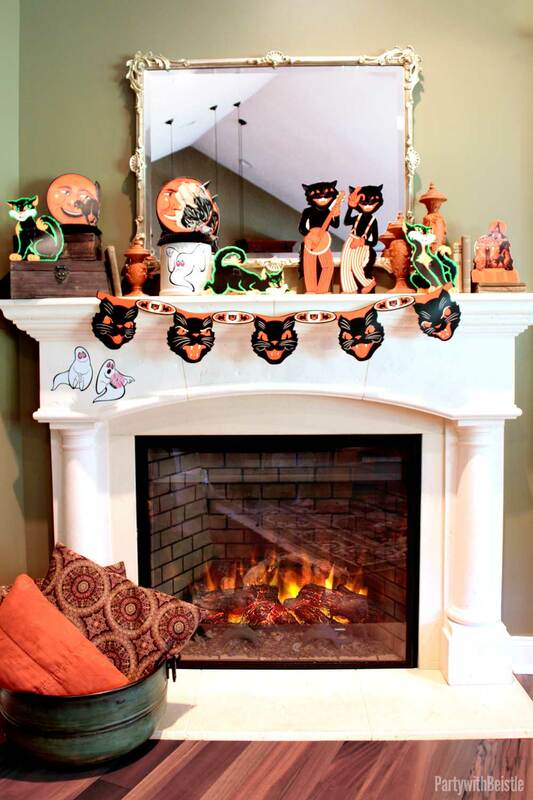 She does a great job using these items to set up for a Vintage-inspired Halloween party. (She has some yummy recipes for Halloween treats as well)! 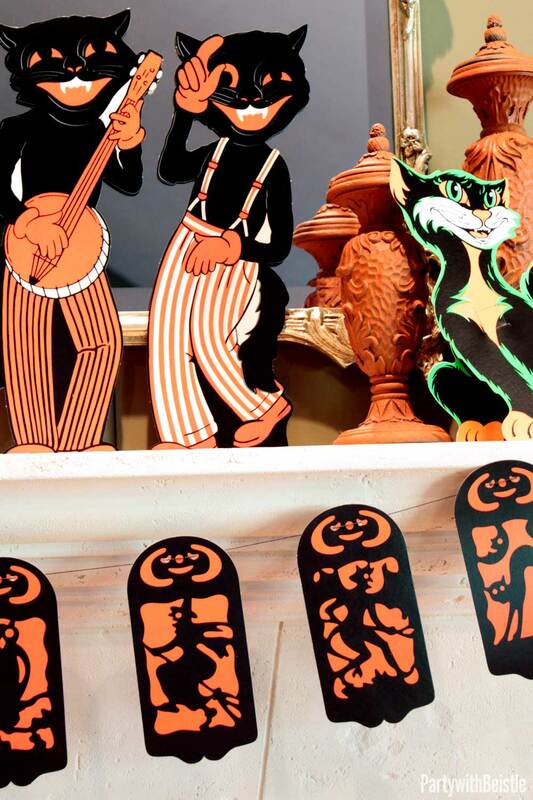 I really hope you enjoyed our ideas for decorating your home with Beistle’s Vintage Halloween decorations. If you like these ideas and would like to keep updated on future posts, please subscribe to the blog (you can enter your email to subscribe on the “Home” page). Please feel free to E-mail me pictures of your own party decorations. I’d love to see how you use our items! To purchase the items from this post, visit www.partycheap.com. (Don’t forget to use your exclusive coupon code found on my “Home” and “Shop” pages). Dragons and Goblins and Trolls…OH MY! Thank you Miranda! I can’t wait either! Mantle decor is my weakness! 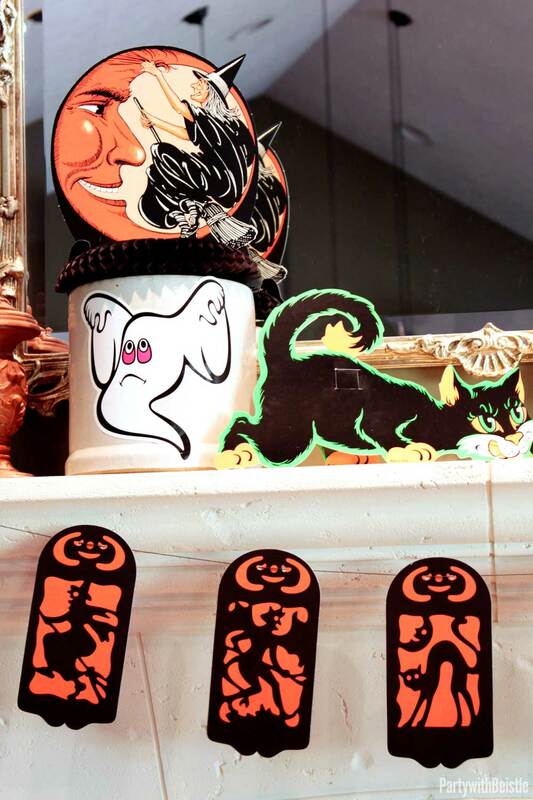 This is gorgeous Heidi – and it has me SUPER excited to decorate for Halloween this year.